Two family threads interwove at the end of the 19th century at the height of the Swiss textile industry: Rudolph Schelling and Hermann Stäubli showed commercial instinct and technical skill in 1892 when they founded the company “Schelling & Stäubli” in the Swiss village of Horgen on the shores of Lake Zurich. Ever since, the company has evolved from a “mechanical workshop” to an international mechatronics group, which today is appreciated by industrial customers worldwide for its cutting-edge technologies. The developments in the past 125 years attest to continuity and passion for innovation, which is the foundation of the company. 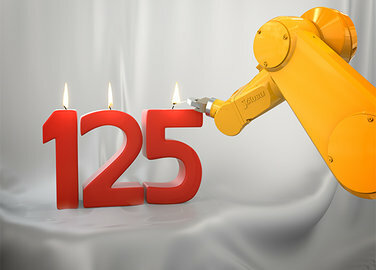 Fittingly, “125 years of passion for innovation,” has become the motto for the anniversary year 2017. Modern, technological advancements and visionary ideas have formed a company that is able to work as successfully in the new millennium as it did at the end of the 19th century. In the late 19th century, the textile industry had its heyday. Stäubli became an important supplier in the weaving trade with a focus on dobbies. Hermann Stäubli acquired his know-how first by repairing imported machines. He soon set a goal to produce a superior product. His demand: the highest quality and a pronounced customer focus. He wanted no less than to construct the best dobbies, with which weaving mills would achieve optimal results. Even at that time, Stäubli had high requirements with regard to efficient production, allowing customers to produce more fabrics at lower cost, with better quality and with a greater variety of patterns. In 1893, “Schelling & Stäubli” delivered their first self-constructed and designed dobby. In 1900, another new development resulted in the first paper card dobby, which was also equipped with a warp leasing system still widely used today. Following the death of Rudolph Schelling in 1909, the company was renamed Stäubli. After decades as a technological pioneer and reliable partner of the weaving industry, Stäubli expanded its expertise in 1956 into quick-connection solutions. “With the start of production of connectors, the Stäubli family took the far-reaching decision to transfer its competencies into additional fields of activity, laying the cornerstone of the company as it is today,” says Strebel. Ever since, Stäubli has been looking for possibilities to develop future-oriented technologies, to further simplify the industrial processes of customers, and enhance their safety. Therefore, it was only consistent to enhance the Stäubli portfolio with electrical connectors in 2002. Another important diversification step was taken in 1982, when Stäubli started its collaboration with the U.S. robotics pioneer Unimation. The acquisition of Unimation in 1989 has been the foundation of Stäubli’s Robotics division, which today is one of the world’s leading players in industrial robotics and automation. Since 1892, the Stäubli Group has grown substantially, both technologically and geographically. In 1909 Stäubli built its first production unit in France, followed by additional production sites in other European countries as well as in the Americas and China. Today the Group has 12 production units and business units in 29 countries. In the age of digital transformation and Industry 4.0, Stäubli continues on its dynamic path as a technological pioneer for the collaboration of man and machine in one of the most advanced and most innovative branches of the industry.